We will break down the different artificial tree species to help you choose the right one for you. Our Washington Frasier is one of the most life-like artificial trees you can buy. Mixed with both PE and PVC tips, the upswept branches of this tree give it a natural look and feel. Although the Washington Frasier has a slim profile, this artificial tree has a luscious and full look, giving the appearance that it was recently cut from the forest. Its hinged branch construction makes for an easy set-up. Available in sizes of 6.5', 7.5', 9', 10', 12', and 14', this tree comes pre-lit with clear lights for easier decorating. You can also complete the Washington Frasier set with wreaths and garland. Add some holiday cheer to your desk or table with a Royal Pine tree from Christmas Central. Though small in size, this medium profile tree can be just what you need to bring a room to life and spread some holiday cheer. Mixed with two-tone light green and dark green tips, this Christmas tree offers a lush, natural look. Designed for indoor use, this 2' foot tall artificial tree is easy to assemble and even comes with its own tree stand. It is available unlit or as a pre-lit tree with clear or multi-colored lights. The beautiful and versatile Green River Spruce is a great choice for any home. With its slim profile and realistic features, this artificial tree can be easily placed in a corner to provide an open space for friends and family to celebrate, or it can be placed in the center to become the focal point of any room. For added realism, the Green River Spruce comes accented with pine cones and two-toned magnolia leaves. The foliage is a tapered blend of PE tips and PVC tips, giving this tree a nice, full look. Spend less time decorating and more time relaxing with the Green River Spruce. Easy to assemble, this tree is available in 5', 7.5', and 9' feet sizes and each tree size comes pre-lit with clear incandescent lights. If you're looking to bring a warm country feel into your home, the Mixed Country Pine is an excellent choice for you. Adorned with baby pine cones and grapevines, the mixed foliage of this artificial Christmas tree provides an array of textures and colors. The light green cashmere bottle-brush needles mixed with the darker green 2-tone bottle-brushed needles provides a unique flair not found in traditional Christmas trees. 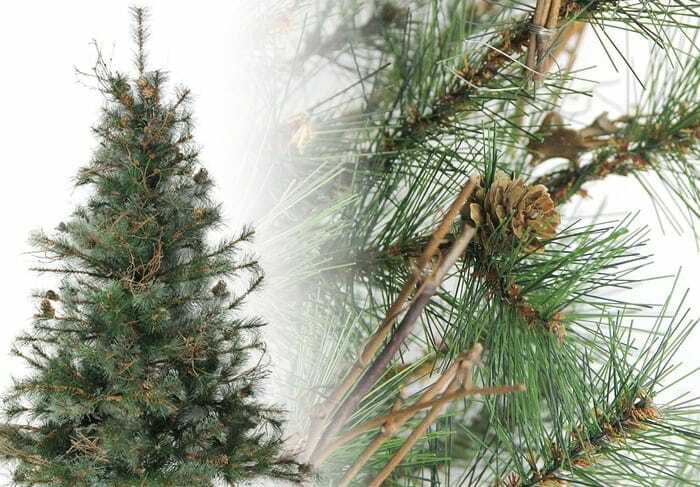 A smaller tree, the Mixed Country Pine is available in both 2' unlit and pre-lit & 3' unlit and pre-lit with clear lights. It is also available unlit at 4'. It is easy to assemble and can be placed in any room to make a unique, fun and dramatic statement. Additionally, you can also complete the set with Mixed Country Pine styled, wreath, garland & swag. The Canadian Pine features a classic look that works in any room. Its durable PVC tips are designed in a two-tone forest green color scheme, providing a lush, full and multi-dimensional appearance. Or, you can try our striking white foliage style for a fun, winter look. The hinged branches of the Canadian Pine make it easy to assemble. In a few quick and easy steps, you can have your tree set-up and ready to decorate with your favorite holiday ornaments. To complete the look, we also offer a selection of Canadian Pine Christmas wreaths and garland. The Dakota Red tree is one of the most natural and realistic artificial trees you will find. Beautifully accented with a lush mix of foliage, its two-tone green colored tips mixed with shorter, light green tips make for an extra dimension and real beauty. A full profile tree, it's made with PVC and adorned with pine cones throughout. This tree has plenty of space to decorate with all of the ornaments that you've collected through the years. For a complete set, we also have Dakota Red garland, wreaths and swag available. 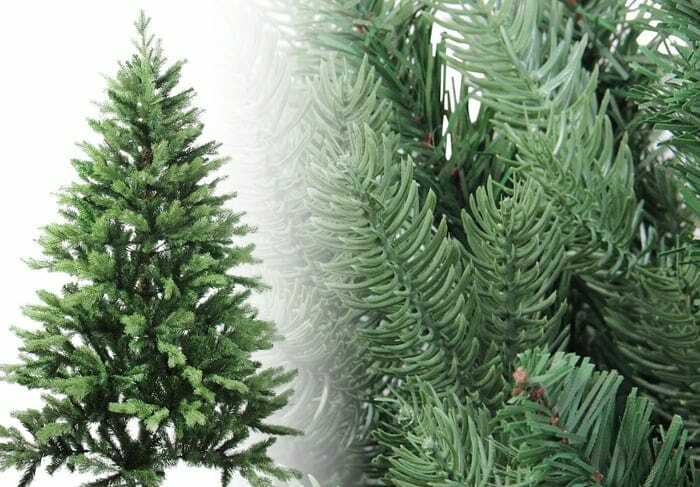 One of our best-sellers, the Hunter Fir is also one of our most realistic artificial trees. With a beautiful full profile of dense greenery, this Christmas tree will immediately catch the eye of anyone that walks into the room. Adorned with small pine cones, the long downswept branch design of this artificial tree is made of PE mixed with PVC tips, giving it an authentic woodland look to impress your holiday guests. The long, sturdy branches of the Hunter Fir provide plenty of room to decorate with family ornaments that you've collected over the years. Easy to assemble, each tree option also comes pre-lit, so you can spend less time setting up and more time creating holiday memories! The 4.5' foot tree is available with multi-colored or clear lights, while the 7.5' foot tree comes with warm clear LED lights. We also offer a pre-lit Hunter Fir wreath to carry this beautiful look throughout your home. 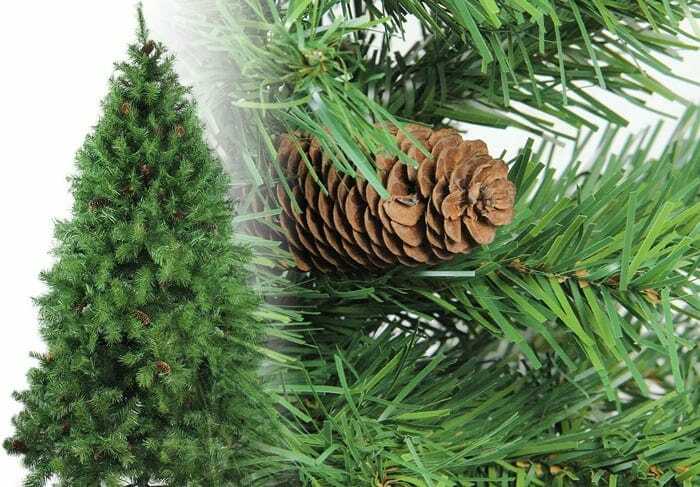 The beautiful Coniferous Pine makes an excellent Christmas tree for any home. 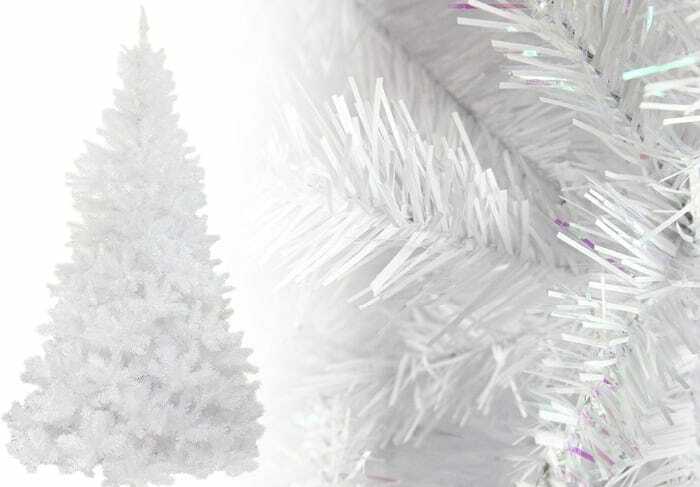 The branches of this artificial tree are made of a mix of PE and PVC tips, giving it a thick and natural look. The medium profile of the Coniferous Pine makes it extremely versatile. This tree looks great in a corner or taking center stage as the focal point of any room. Its branches are ideal for Christmas decorations, providing you with space to show off some of your favorite ornaments. This Christmas tree is available unlit in 5', 6', and 7'. 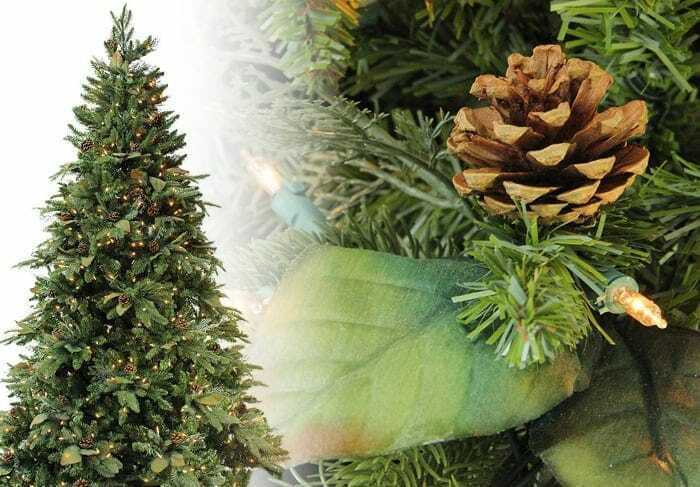 We also offer wreaths, garland and teardrops to complete the Coniferous Pine set. The Northern Pine features perfectly tapered tips with a medium green color. One of our best-selling styles, these magnificent artificial trees have a natural, lush look and feel to them. 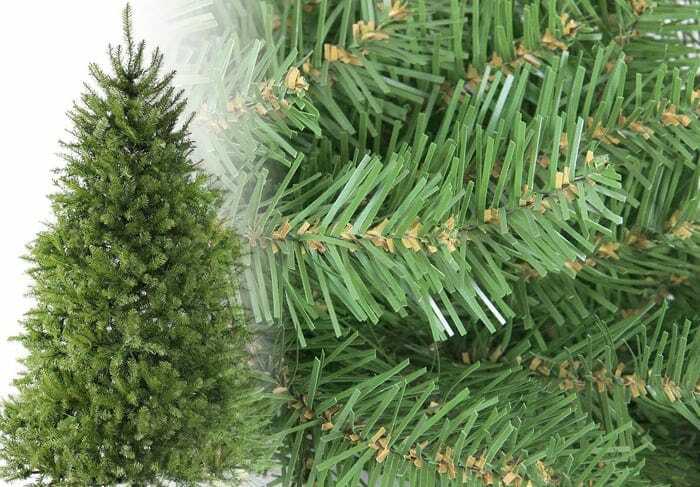 In addition to artificial trees, our Northern Pine series also includes matching wreaths and garland to complete the look both inside and outside of your home. With its dense look and sturdy branches, the Buffalo Fir is a great choice for any home. The 2-inch wide, tapered PVC tips and a two-toned medium green design provide a natural look and feel to this artificial Christmas tree. Additionally, we also have Buffalo Fir wreaths, garland and swag available to complete the set. Our highest quality commercial-grade tree, the Olympia tree looks so real, your guests will believe it was freshly-cut from the forest. 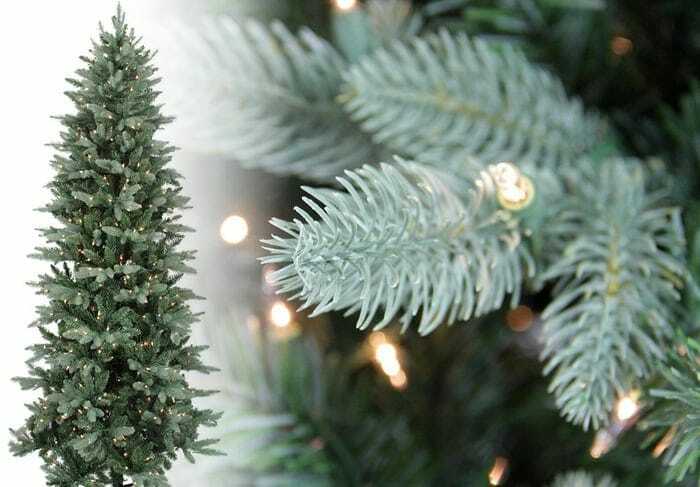 Along with its majestic look and medium profile, the galvanized steel construction and crush-resistant PVC tips of this artificial tree make it extremely durable and an ideal tree for both indoor and outdoor use. At 7.5' feet, this tree comes pre-lit with warm LED lights, making holiday decorating easy and fun. Equipped with its own rolling tree stand, this elegant and stylish tree can be easily moved even after setup is complete. We also carry a matching wreath, garland and column spray. Our Angela Pine can provide your home with a breathtaking wintertime look. The frosted needles on this artificial tree invoke a sense of the magic experiencing the first, fresh powder of snowfall. The full profile of the Angela Pine, along with the wide PVC tips of the branches make this a great tree for hanging ornaments. Additionally, the realistic pine cones scattered throughout will ensure no empty spaces in creating a rich and magical Christmas scene. This Christmas tree is available unlit in sizes 5', 6', and 7'. You can also buy Angela Pine wreaths and garland to complete the set. If you're searching for a tree that's a little less traditional, the Warsaw Twig is the right choice for you. With its 2-tone neutral dark brown and green tips, this Christmas tree can bring a unique and lively look to any home. Though it is an artificial tree, this tree has a very realistic and primitive look to it. It even comes with exposed, bendable twigs. The majestic Colorado Pine features wide-tapered PVC tips, and provides a naturally warm deep-green color. Modeled after the beautiful pine trees found in Colorado, the stunning and realistic look of this full-profile artificial tree will have you thinking of the great outdoors. Easy to set up and with branches that are sturdy enough to hold your favorite holiday decor, the Colorado Pine is a great choice to showcase all of your memories. Enjoy the holidays as you relax by the fireside, look at your beautiful tree, and admire all of the prized ornaments that you've collected over the years. This Christmas tree is available unlit in sizes of 4', 5', 6' ,7' and 8'. 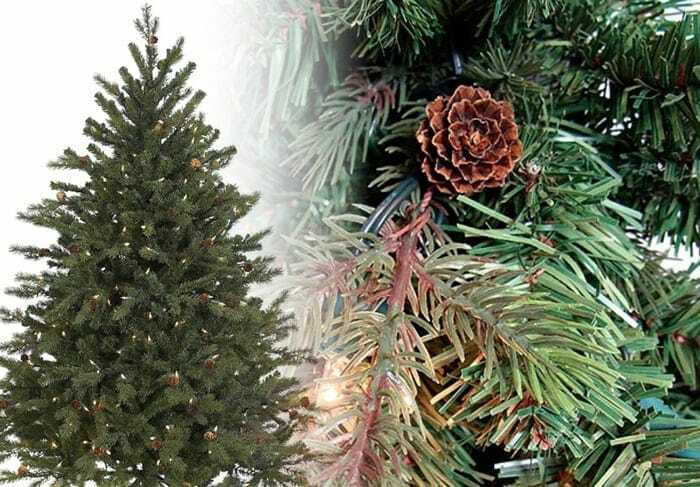 For a complete look, the Colorado Pine series also includes Christmas wreaths, garland and teardrops. 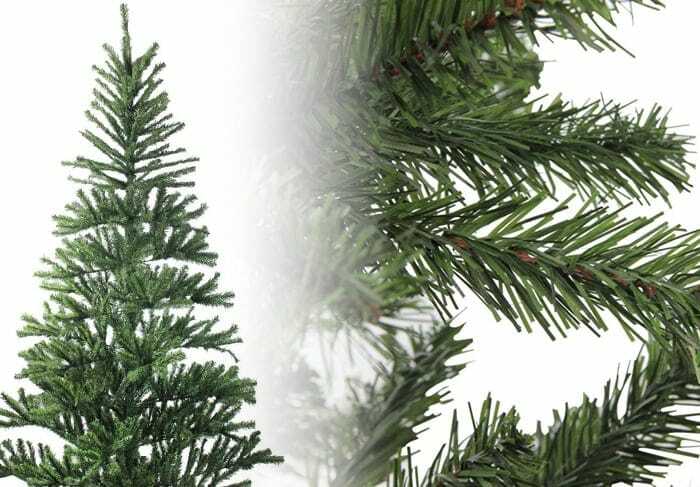 A beautiful combination of PE and PVC tips, the Aurora Spruce features a full profile and layered branches that are perfect for decorating. 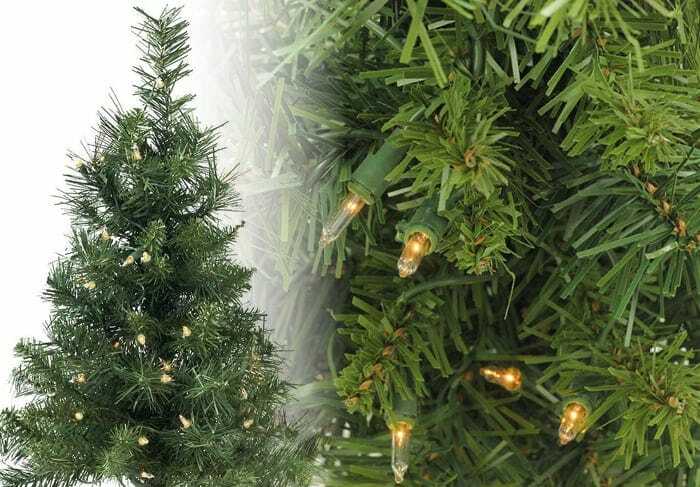 Available at 7.5' and 9', this durable & realistic tree comes pre-lit with clear incandescent lights. 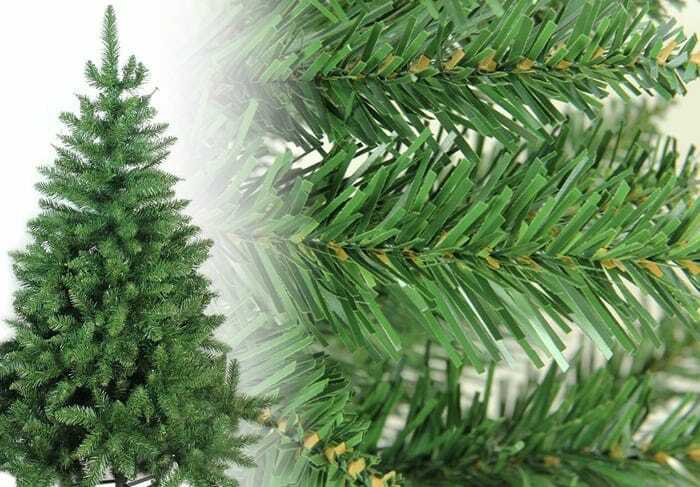 The Canterbury Spruce is a classic tree featuring a combination of long and short PVC needles. These needles are durable and realistic, with added for a sense of authenticity. Available as a 7.5' pre-lit tree with clear incandescent lights, saving you time and the hassle of stringing lights on the tree yourself. The medium profile of the Canterbury Spruce provides a full look, while leaving room for guests to admire your holiday display.